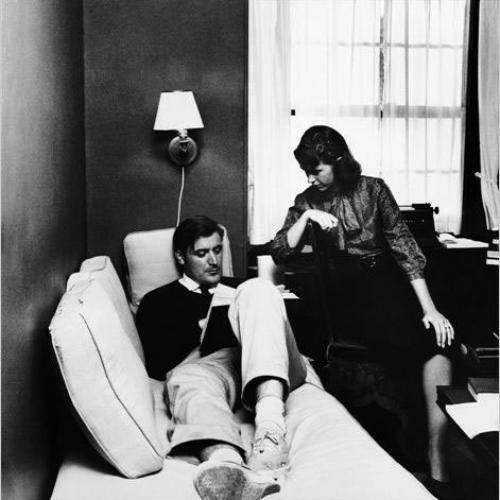 McDowell attributes the genesis of her book to her wish to understand her own experience, which included a relationship with an “emotionally shaky” male writer who relied on anti-depressants and drank heavily. This, along with a review she read of a memoir about the writers George Barker and Elizabeth Smart written by their son, left her wondering about the relationship between sexual desire and the desire to write, not to mention the ways and whys of power claimed and power relinquished between men and women. What emerges are nine largely unhappy tales about women who “lie down for artists,” as Plath once put it, in the service of their own writing, and about the men who embolden and protect them (when they are not betraying or abandoning them). Since most of the relationships examined in this book have been written about before, some quite exhaustively, McDowell is under pressure right off the bat to provide something new in the way of interpretation or perspective. To this end she has provided a typology of feminine roles: Rebecca West is the “mother,” while one or another of the group is the “mistress,” the “companion,” the “chaser,” and so on. These distinctions do not really hold up, of course. West is a “novice” as well as a “mother,” while Jean Rhys might be said to be a “survivor” as well as an “ingénue.” All the same, the device gives the author a means of entry into relationships that are encrusted in anecdote and myth, not to mention pre-existing narratives. What seems clear is that without Murry prodding her on, without his fantasies of literary greatness for both of them, Mansfield might have produced less sterling work. At the same time their union was founded on a delusion of intimacy that was belied by how much time they spent apart and how erotically arrested they were when together. McDowell believes that Murry truly loved Mansfield and that Mansfield “loved him as much as she was capable of loving anyone.” What they had in common was a devotion to Mansfield’s art, which, in her case, suited her more than not. “It was the needs of the writer that came first,” McDowell notes, “and to those needs, she was ever faithful and true.” Perhaps she would have been happier with a different man—or, if she had followed her bisexual leanings, with a woman—but it is impossible after reading this account to see Mansfield as anyone’s victim. It is laudatory that McDowell has set herself against the tenor of much of the critical discourse on the price of female talent: even so idiosyncratic a thinker as Elizabeth Hardwick was inclined to look at victimhood as the natural habitat of creative women, especially when they teamed up with creative men. One might wish for a more mellifluous prose style and more bold speculation on the role of the eroticization of intellect, but overall this is a welcome addition to the lives of writers in love and lust—writers who sometimes manage to write peacefully together in the same room, and who are equally dominated by the same demanding master: literature. Daphne Merkin, a novelist and critic, is a regular contributor to The New York Times Magazine. She is at work on her third book, a memoir about chronic depression.